Had the police known there was barbed wire hidden in the floral arrangements, things might have gone a little differently. 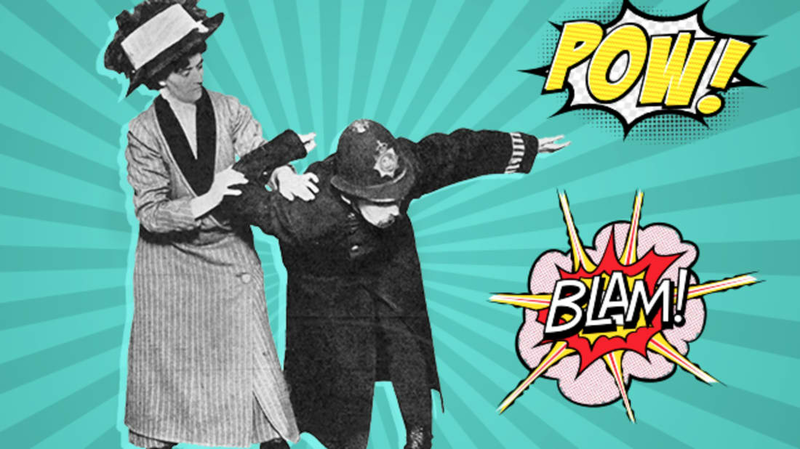 The officers had poured themselves into an assembly hall in Glasgow, Scotland, in March 1914 to arrest Emmeline Pankhurst, one of the loudest voices in the British feminist movement who had traveled from London to rally support for her cause. Women, she declared, deserved the right to vote, to ask for a divorce, or to inherit land. Anticipating a fight, she arrived with an army of women—roughly 25 in all—collectively known as the Bodyguard. These “Amazons,” as the press breathlessly reported, were trained in the art of jiu-jitsu, club-fighting, and sabotage by Edith Garrud, one of the first female martial arts instructors in Europe. Unlike many who study self-defense, the women weren’t preparing for hypothetical threats. The police had pummeled them with their fists and sticks before, and wouldn’t hesitate to do so again. Pankhurst had already made police look foolish by evading arrest at the entrance: She simply bought a ticket and walked in, presumed to be a spectator. As she stood holding court, the uniformed officers began to advance, outnumbering the Bodyguard by two to one. One of the women—dubbed “suffragettes” in newspapers— pulled out a pistol and took aim, firing. They were blanks, but it stunned her target. Other officers were tossed in the manner Garrud instructed, tumbling into razor-sharp bouquets. Indian clubs, which were shaped like bowling pins, emerged from the women's dresses and were used to batter their foes. The melee would later be referred to as the “Battle of Glasgow,” with Pankhurst finally being dragged away. It was little wonder why she needed protection, or why Garrud was the woman for the job—despite the fact that she stood only 4 feet 11 inches tall. The illustrated art of Edith in action. Image courtesy of Bartitsu.org. Born in Bath, Somserset, in 1872, Garrud’s parents were unmarried, a shameful circumstance for the time. Sent to live with her aunt, she had difficulty fitting in at school and took to athletics as a means of busying herself. In 1893, she and fellow fitness enthusiast William Garrud were married; in 1899, the couple saw a demonstration by Edward Barton-Wright, a compact man who had developed his own blend of grappling and striking he dubbed Bartitsu—a style (misspelled as “Baritsu”) so well publicized it was name-dropped by Sherlock Holmes in a 1903 Arthur Conan Doyle story. Garrud had gotten some publicity for a short 1907 film reel that displayed her skills and was invited by Pankhurst to appear at a Women’s Social and Political Union meeting in 1909 after William got ill and couldn’t make it. The suffragettes were so impressed by her abilities that they asked her to begin regular training sessions. 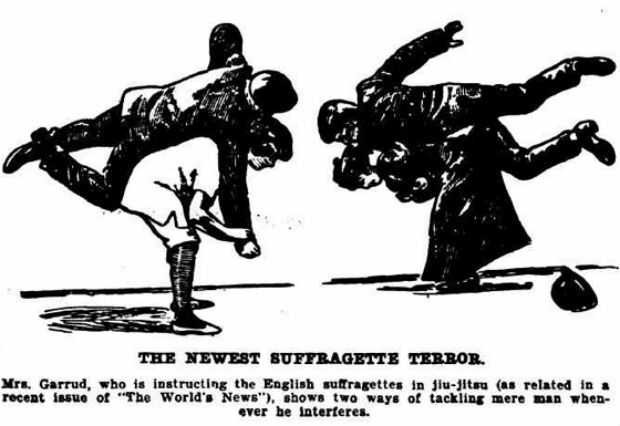 By December, Garrud was running the Suffragette Self-Defense Club. The idea of a physically domineering woman arming the feminists with combat techniques (even as they wore wide-brimmed hats and elaborate dresses) was something the press couldn’t get enough of. A 1910 Punch Magazine cartoon of a capable suffragette cowering police. Image courtesy of Bartitsu.org. Garrud’s responsibility was considerable: Pankhurst and her protestors were radicals, setting mailboxes on fire, throwing “flour bombs” at the Prime Minister, and smashing windows of shopkeepers that refused to support their cause. A visiting Mahatma Gandhi addressed the suffragettes in 1909, telling them their cause was just but their tactics unacceptable. While Gandhi simply shook his head, police response was brutal: a 1910 confrontation ended with several women battered. When women were arrested and refused to eat in protest, they were force-fed with rubber hoses. Those imprisoned sometimes saw Garrud climbing atop prison walls, singing and waving a flag; those freed were taught how to throw policemen through the air and avoid being bludgeoned by wrapping cotton and cardboard around their ribs. As the fight dragged on and it became clear Pankhurst was not going to fold, authorities invoked a new law dubbed the Cat and Mouse Act. It stated that protestors who were arrested and refused to eat would be set free. Once they had returned to health, police would re-arrest them. Tempers flared on both sides; the Women’s Social and Political Union even took credit for blowing up a vacant house recently purchased by Chancellor Lloyd-George. The Pankhursts decided the fugitives needed protection. Garrud was charged with training the Bodyguard, the squad of women who would serve as a barrier to deter cops. They were organized, swift with clubs, and seemingly fearless in the face of badges. Police, aware of Garrud’s tenacious skills, tried spying on their lessons from skylights. 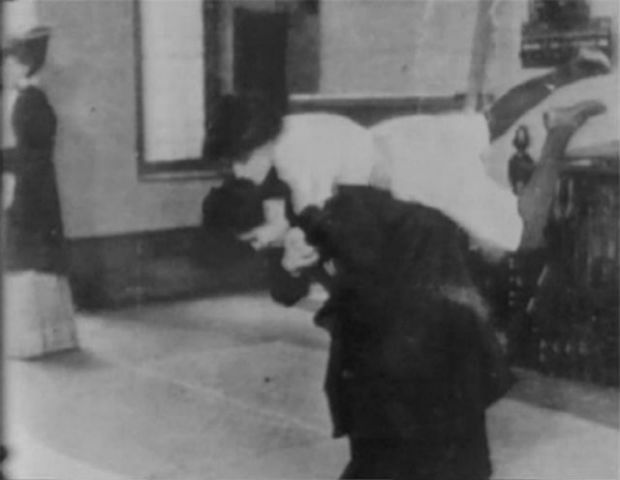 Edith Garrud tosses a suffragette in training. Image courtesy of Suffrajitsu.com. In February 1914, just a month before their rumble in Glasgow, the Bodyguard were faced with another bloody scenario. Emmeline was delivering a rousing speech from a balcony in a Camden Square home. Police were waiting below, eager to re-arrest the fugitive. When she declared she was coming down and dared authorities to stop her, they swarmed her protectors. After a protracted struggle, they finally managed to nab Pankhurst. Stopping to catch their breath, police looked more closely. They had caught Pankhurst’s double. The real thing had remained inside, spirited away in the opposite direction. The Bodyguard used wits and jiu-jitsu in equal measure, even knocking one policeman unconscious in front of Buckingham Palace. The only thing that could stop the Pankhursts in their tracks was the declaration of actual war. 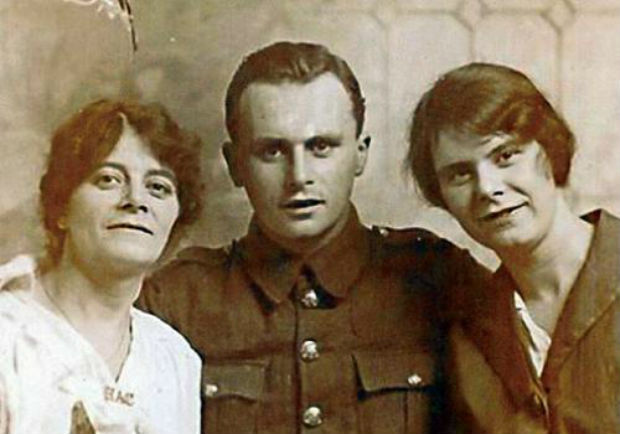 When World War I broke out, Emmeline decided that women’s rights wouldn’t be of much use if Germans occupied Great Britain and she decided to focus her efforts on keeping her country free. By war’s end, women finally won their right to vote. Edith Garrud with two of her children. Islington Tribune. Fit and disciplined, Garrud passed away just shy of her 100th birthday in 1971. 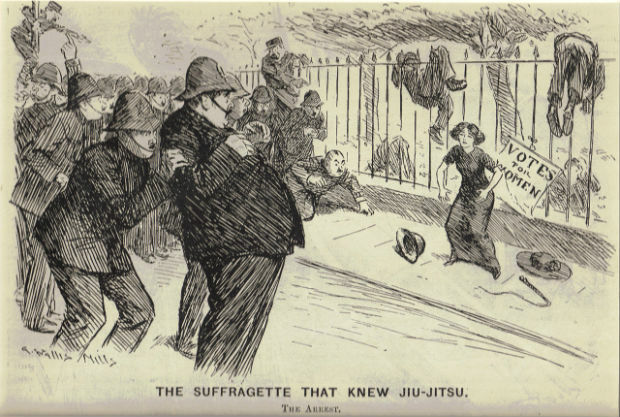 Additional Sources: Bartitsu.org; Femininity, Crime and Self-Defence in Victorian Literature and Society; “Soft Power of the Soft Art: Jiu-Jitsu in the British Empire of the Early 20th Century,” 2011 [PDF].